Are you a Downton Abbey fan? We viewers in the US are counting the days until January 3, 2016 , when the final season of Downton begins. UK fans -- don't tell me what happens! More than half the blocks for this quilt! Our school district is closed tomorrow, so I should be able to get the quilt top almost finished. Yay for snow days! Saturday is my 4th Blogiversary -- come back to celebrate with a big giveaway! I am a fan Downtown Abey, too!!!! And your Quilt is so cure!! I agree...I can't wait for Downton Abbey to start but I don't want it to end...beautiful quilt...enjoy the snow day! This was so funny to read this morning because I am also currently working on 2 Downton Abbey quilts! 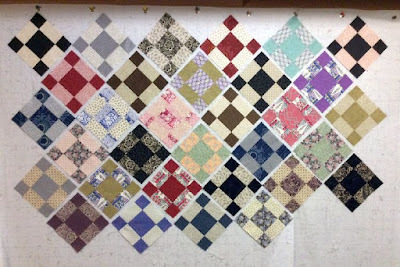 The first is all fabrics from last years collections being worked up into Lori Holt's Great Granny Squared design. The second is a "modern" pattern being made with the Christmas Collection. After that, I can't wait to use the Downton Abbey Celebrations collection in something, too!!! I just love these fabrics!!! It has been a great series to watch, though I doubt the downstairs staff had such great lives in real life way back when! I'm waiting to see The Walking Dead series 6, I know, abit different true but Ive enjoyed the characters in it, rather than the gore! I am a lapsed Dowton Abbey fan. I watched regularly, then life got in the way of TV. We have Netflix now. I should try to catch up. The last I saw was the one with the car accident that ended badly!